Home > Blog > What is cloud printing? 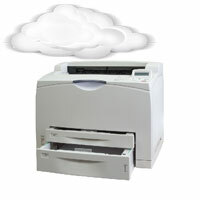 Cloud printing is technology allowing printers to be accessed through a network using cloud computing. With this technology, it is possible to print over the web from anywhere. Plus Technologies has developed a solution called OM Plus i-Sat. It is simple, easy to install, easy to use, cloud enabled, printing software that is ideal for organizations that need to print from ERP/EMR and other back-end applications to remote sites such as, satellite offices, affiliate organizations, business partners, and home offices. Today, remote users commonly use VPN as a means to access host systems. VPN access means these users become “virtual members” of the host system which can create security vulnerabilities. In many cases these remote users are not organic company employees but business partners or affiliates such as clinics or doctor offices. Organizations may not have control over these end user systems creating vulnerabilities. VPN connections also consume IT support resources and can be relatively expensive. OM Plus i-Sat addresses these issues. OM Plus i-Sat includes a small application for the remote location that uses cloud enabled, secure web services to “pull” print jobs from the host application without the vulnerabilities of a VPN connection. No VPN connection is required. i-Sat connects to an OM Plus print sever at the host location and requests its jobs. These print jobs are then sent securely, encrypted and compressed via https to the i-Sat at the remote site. No persistent connection is required. No technical expertise is needed at the remote location. For more information on this solution, contact Plus Technologies.